Following two years of military service during World War II, Chandnois was an all-purpose star at Michigan State, rushing for 885 yards on 129 carries, intercepting 7 passes, and accumulating 1382 total yards as a senior in 1949, when he received some All-American recognition. Overall, he gained 3535 all-purpose yards, including 2103 rushing with a 6.6-yard average, and set school career records for interceptions (20) and interception return yards (410). 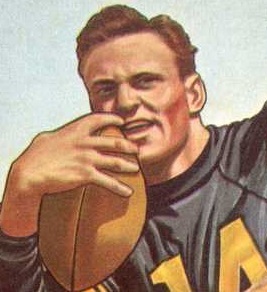 Chandnois was chosen by the Steelers in the first round of the 1950 NFL draft (eighth overall). With speed and excellent running ability in the open field, he made his biggest mark as a rookie returning kickoffs as he averaged 29.3 yards on 12 returns. His numbers were more modest on offense, where he gained 216 yards on 71 rushing attempts (3.0 avg.) and caught 7 passes for 158 yards (22.6 avg.). Steelers went 4-7-1 to finish fourth in the NFL American Conference. Chandnois again led the NFL by averaging 35.2 yards on 17 kickoff returns in 1952, two of which were touchdowns. He also rushed for 298 yards and caught 28 passes for 370 on his way to accumulating 1378 total yards and was selected to the Pro Bowl. His most productive season came in 1953, when he achieved career highs in rushing attempts (123), yards (470), and pass receptions (43), and averaged 29.0 yards on 21 kickoff returns, leading the league with 1593 all-purpose yards. Chandnois was again named to the Pro Bowl. He spent three more seasons with the Steelers, with declining numbers due to injuries, until 1956. Overall, he averaged 29.6 yards on 92 kickoff returns, still among the highest marks in NFL history. Chandnois also rushed for 1934 yards on 593 carries (3.3 avg. ), caught 162 passes for 2012 yards (12.4 avg. ), and averaged 4.7 yards on 66 punt returns. In all, Chandnois accumulated 6978 all-purpose yards and scored a total of 26 touchdowns. He was a two-time Pro Bowl selection.